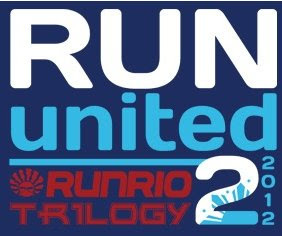 To accomplish my goal of running in the three legs of Runrio Trilogy this year, I signed up for Run United 2 2012 in the first or second week after it was announced. I wasn't really excited; it's just that during those times, I was already processing some papers and stuff for my work transfer. When I registered at Toby's Sports SM Mall of Asia, I was disappointed with the automated registration system of Runrio. I had to restart filling up the form because of a limitation of the system, which to begin with is not user-friendly. Anyway, after paying, I only got a singlet and was advised to go to Run United Race Expo whose venue is yet to be announced. A few days or weeks later, the venue for the Race Expo was set at Bonifacio Global City. Since I now working in Alabang and it closes at eight in the evening, I just decided to go on Saturday, which is the last day of the expo and also the day before the run. As I was near the venue, I realized I forgot to bring my receipt. Good thing I still remember my code in the receipt and got the race bib and the free race belt. I also took a look inside the stalls in the Race Expo and bought myself a running shorts. On the day of the run (June 17), it was raining because of Typhoon Butchoy. I thought this will be my first run in the rain. However, when the gun start is already near, it is no longer raining nor drizzling. I was a little nervous on the run because it has been months since I last ran. I've been too busy with work and the transition that I had not been able to have some time running. With this in mind, I decided to just run and not force myself to finish it. After more than 5k, my body started to feel pain. Good thing there was bananas in a hydration station. It was the first time for me to eat a banana in a run and it felt good. Slowly, the pain I'm feeling started to go away. I finished the run in 1:12:50 (based from My Tracks). Update: Based from the official results, I finished the run in 1:08:17 (Chip Time) and 1:09:54 (Gun Time). The race analysis is also available here. Not bad! I actually beat my record last Run United 1 by a few minutes although I was unable to be near my 10k record (1:02:48) last year at the Takbo.ph NightFest.